On July 30, the family atmosphere and buzz of excitement at the sold-out New Candlelight Dinner Theater in Ardentown reflected a twist: for three nights of the summer production of "The Wizard of Oz," the professional adult cast took a break, and a young cast of up-and-coming actors from the NTC's theater camp took over. 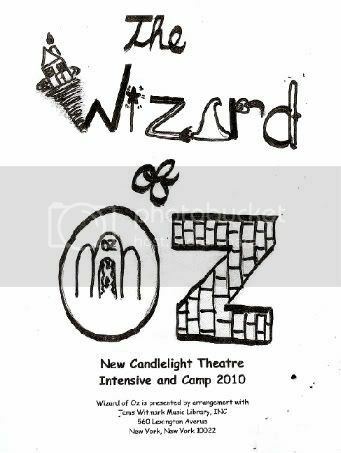 One nice thing about "Oz" is that the Summer Camp Performances could incorporate both the younger Basic campers, who range in age from 7 to 11, and the older and more experienced Intensive campers, who are aged 12-18. After three weeks of rehearsals (two weeks for the Basic campers), the result was impressively polished, with colorful costumes, tight choreography and strong vocal performances. This stage version (Directed by Paul Goodman and Choreographed by Shauna Goodman) is based closely on the Judy Garland film, featuring the classic songs "Over the Rainbow," "Follow the Yellow Brick Road," and "Ding Dong the Witch is Dead," as well as the lesser-known "Jitterbug," based on a deleted scene from the film, that's complete with an elaborate dance sequence. As this was my first time experiencing a NTC Summer Camp performance, I had to wonder if they always luck into enrolling campers who are such perfect fits for the roles. From the munchkins to the principle actors--Elise Brown as Dorothy, Kayla Saunders as Scarecrow, Richard Gantt as Tinman, and Chandler Smith as the Cowardly Lion-- they spot-on captured the characters we all know so well. While most of the traditionally dual roles were split between two of the 50+ youth actors, Adam Gorowara played both the title role (with the help of an impressive giant puppet head) and the mysterious Professor Marvel with humor and apparent ease. Not least of all, the two witches, Good Witch Glinda, played by Christina Wyatt, and Emma Eckert as the Wicked Witch (as well as Becca Shumosic as her alter-ego Miss Gulch), were scene-stealers, as all witches should be. The NCT offers a full evening of dinner and entertainment for one price, with a full cash bar available. Normally, the show's actors double as servers, but on this night those duties were taken over by adult members of the staff and crew. For the Summer Camp Performances, the buffet featured kid-friendly options, including surprisingly good macaroni and cheese and, in addition to choices such as Thai-chili meatballs, tilapia in cream sauce and shrimp cocktail. The culinary highlight, for me, at least, is the show-themed cocktails. For "Oz," that means the citrus-and-cream Yellow Brick Road, the Ruby Slippers, and the green Emerald City drinks. Since I wanted to be sharp for the play, I only tried one--but I can vouch for the Yellow Brick Road and say that the cocktails are definitely worth the extra charge. There is still time to see the adult cast perform "The Wizard of Oz," which runs through August. Great show ! I thoroughly enjoyed it.......great performances by all. The WWW was my favorite.